Hey everyone! I know, the title of today's post IS SO EXCITING. You are seriously all probably on the edge of your seats!!! I finally ventured out of the house today, we went to Panera Bread for lunch and then went to Target for some necessitates. I must be weird, because I feel like the stores are so boring right now..I guess it's just the transition from Christmas to winter. But I'm over it. As anxious as I was to get out of the house, I couldn't get back home fast enough. I'm such a homebody, I swear! On the bright side of things, I got a pretty little package on my door step today! Yup, my new Erin Condren planner came today and I'm freaking out! If you follow me on Snapchat (@glamfarmhouse) you probably have an idea of how excited I got. Maybe a little too excited. But that's how I roll. I mentioned on Instagram earlier I was feeling blah, Savanna was sick the other day so I guess I'm getting whatever she had. My stomach is feeling all gross so I'm stocking up on the Vitamin D! Hoping I kick whatever this is soon! I guess it's just that time of year when literally everyone is sick. GROSS. Anyway, I used to do this thing on insta where I shared some of my favorite cleaning tips once a week, I don't know why I stopped.. but I decided to start back up. Because we all could benefit from a tip or two now and then when it comes to cleaning..maybe one day, I'll tell you all how clean your house in 10 seconds with your eyes closed, but currently, I unfortunately DON'T know how to do that YET. But if I figure it out, you'll be the first to know. Umk?! 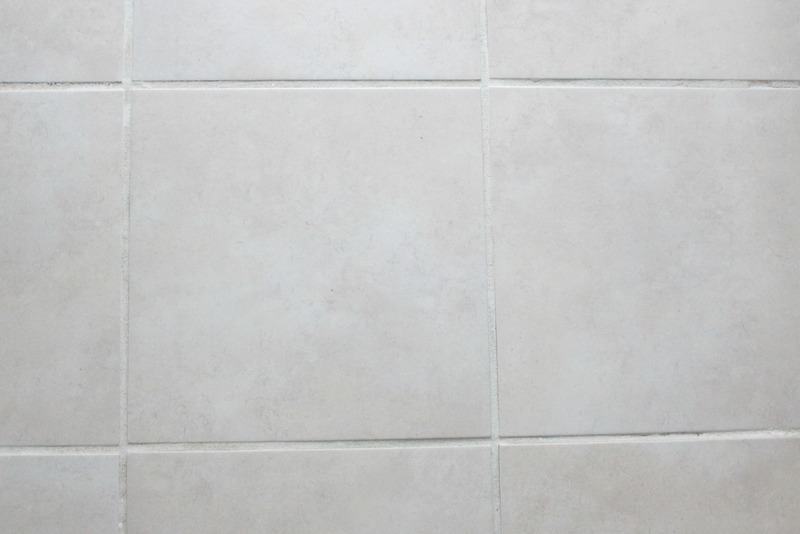 So, you've probably heard of this little "tip" on how to clean tile. Maybe you've pinned or saved it before and you just never tried it. I'm here to tell you, IT WORKS. PS. 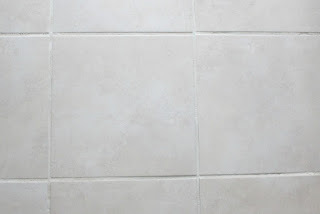 let's leave the comments about how stupid I was to get white grout to ourselves, okay? Because seriously, I can't wait to redo this bathroom and say goodbye to white grout FOREVER. But. FOR NOW. I'm stuck with it..and that means I'm stuck scrubbing and cleaning. I literally scrub this floor at minimum once a week, but the grout gets so dirty SO fast. I hate it! So obviously I've tried everything to scrub, scour, and clean the tile. Until one day, I saw a bleach pen in the cleaning section at Target (surprise!!) and decided to give it a shot. Would it work? Who really knew.. but I bought two in case I decided this was the miracle I'd been waiting for. Seriously, check out how dirty the grout was..
and how pretty and white it is, after I let the bleach pen sit for about 15 minutes. Best part is, the bleach literally does all the work for you! I did use an old toothbrush to scrub the bleach out of the grout, but I hardly even had to scrub. It literally just worked by itself. I. AM. SOLD. So that's how I spent by day folks, going to lunch and then getting excited to come home and scrub my floors. WHEN DID THIS BECOME MY LIFE? I have tried this... But on grout that had about seven years of grime caked on so sadly it didn't work. 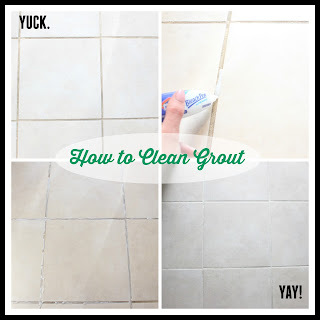 If only our previous owners cared about grout like I do!! Nooooo 😩😩 did you let it sit for awhile?!! First off, you will LOOOOVE your ECLP! I use mine every single day and it's basically the best thing ever. Second, I have thought about trying this, but I've always wondered if it really worked or not, so thank you for showing us that it does! I may try this over the weekend! 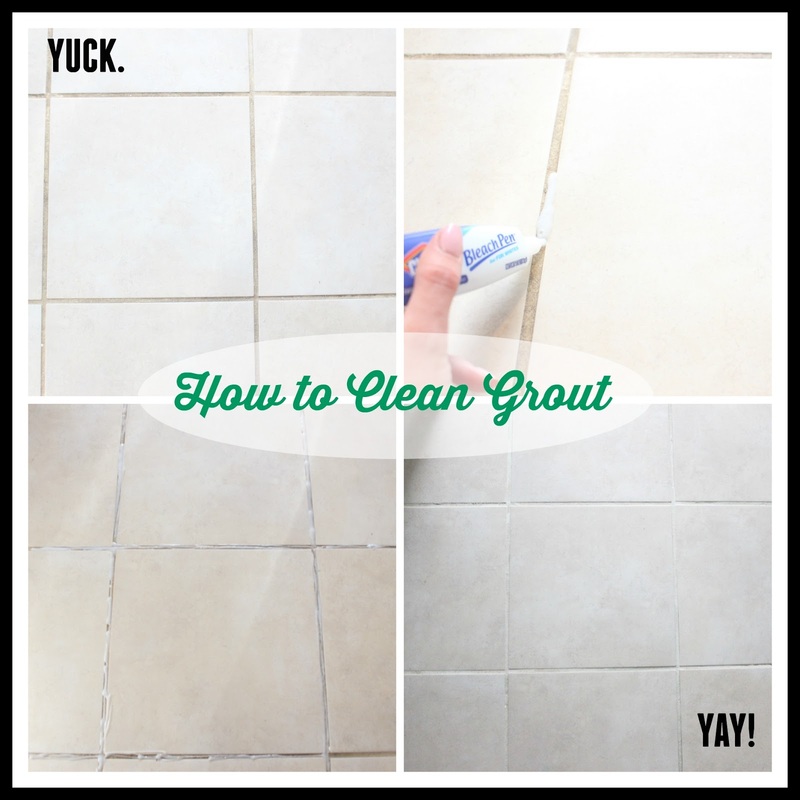 I always see grout cleaning tips on Pinterest, but friends who have tried some of the methods say they ended up with a complete mess. This looks super simple and not messy at all. Thanks, Laurie!